Story redefines the notion of a night out in the “Magic City”. 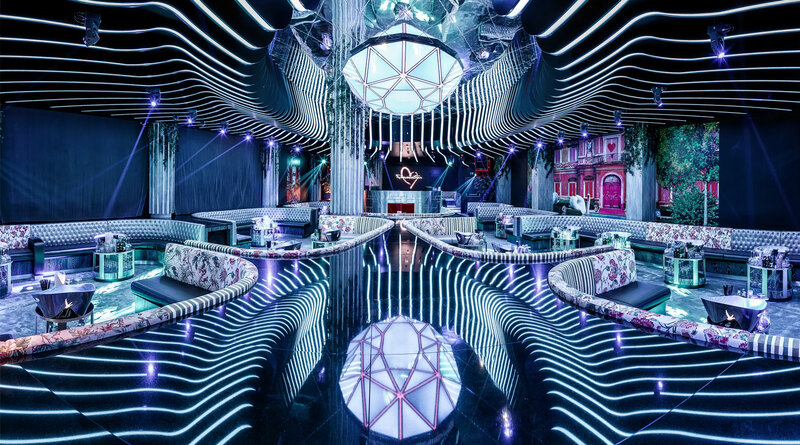 This 26,000 square foot mega nightclub was completely gutted from its previous incarnations and remodeled to house a theater style seating dance box with its focus on the dance floor, the show and the music. The cavernous two-story nightclub can easily accommodate over 2000 people, accompanied with 56 VIP tables and 5 accessible bars. The design of the space is set in dark tones to emphasize the state of the art lighting system, one of the most complex and unique in the nation. The main dance floor is surrounded by six twisted spiraling columns wrapped in dark brown crocodile skin vinyl and accentuated with pixel mapping LED strip lights. Suspended above the dance floor is a star shaped lighting rig with 3264 ping pong sized LED pixel balls, each one individually controlled by the lighting and video jock. All the energy is focused toward the oversized DJ booth which is flanked by 5 huge LED video walls and its own private VIP seating area. The mezzanine floor is wrapped on the perimeter with custom mirror led wall panels which are synced with the rest of the show lighting. All combined, the lighting show creates a unique atmosphere that leave patrons something to “wow” about the next day.